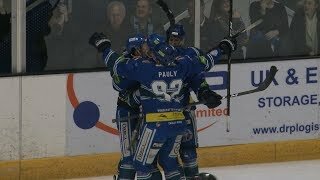 A double from former NHLer Patrick Dwyer was enough for the title chasing Belfast Giants to narrowly overcome the Genting Casino Coventry Blaze for the second night running by a score of 2-1. 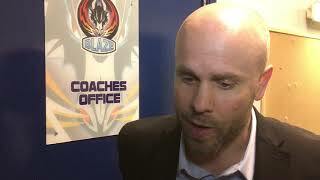 Both teams lined up as per Friday night meaning Stephen Murphy was again Belfast’s starting goalie and the Scot was called into action early to deny a number of Blaze opportunities in the opening twenty minutes. His counterpart in the Coventry goal, Canadian Matt Hackett also began well helping his side kill off a couple of minor penalties before the teams headed to the locker room for the first intermission with the game scoreless. The opener came at 24.47 as Kyle Baun showed great patience on the powerplay, finding Dwyer who made it 1-0 past a sprawling Hackett. The Blaze didn’t let the goal deter them though as further chances came their way. Alex Nikiforuk and Kevin Morris both being denied on breakaways as Murphy continued to steal the show. After a stunning save by Blaze Man of the Match Hackett, he was again beaten by Dwyer just a couple of minutes later. The Giants forward cutting in from behind the net and finishing well on 48.00. It was 2-1 at 50.19 as GB International Luke Ferrara’s attempted cross-ice pass was deflected into his own net by Belfast’s Josh Roach on the powerplay. With the intensity rising to end the game both netminders were kept busy but neither was to be beaten again as the buzzer sounded for a final score of 2-1.